Sigmatic Review 2019: Is Sigmatic a Good Hosting? Sigmatic is a Finland-based web hosting company with more than 15,000 customers. Their hosting solutions include shared hosting, VPS hosting, and dedicated servers. Established in 2001, Sigmatic is a Finnish web hosting provider based in Helsinki. They provide a range of hosting solutions that include shared hosting, SSL certificates, VPS, and dedicated hosting. In 2017, the vendor became a part of Nebula, an ICT service company. 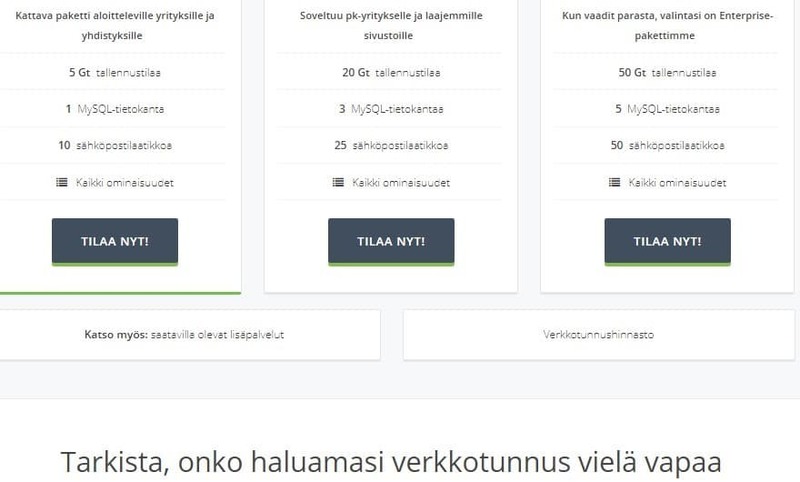 Today, they are in the list of the top ten biggest hosting vendors in Finland by market share. They have more than 15,000 customers in Finland and other countries around the globe such as Sweden, the United Kingdom, Czech Republic, and Estonia. 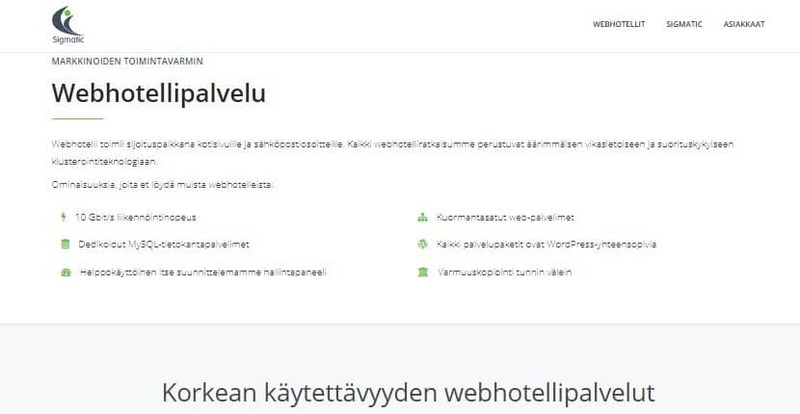 The vendor’s website is only available in Finnish. Sigmatic data centers are under 24/7 observation and they are connected to a fast backbone network updated to 30 Gbit/s to enhance their servers’ operating speed. While they claim that all of their web hosting services are operated on a faultless clustering technology for high performance and availability, their database server is a bit slow resulting in slow webmail as well as slow FTP file transfers. Sigmatic provides daily data backups that are performed by an external backup server for easy file retrieval incase of a disaster. The vendor provides SSL certificates as an extra package for users who need more advanced verification. The standalone SSL package comes with four different types of certificates, including a DV certificate that allows encryption of a single domain and an EV Certificate that is specially designed for e-commerce websites. Sigmatic uses their own self-designed, easy to use control panel. While new users have to learn how to use this dashboard, the vendor has used a WYSIWYG approach, giving it an intuitive design for increased user-friendliness. In Addition, SFTP and FTP support make it easy for users to migrate their websites to the server. It is possible to make pretty common file operations such as transferring, copying, and renaming files. However, VPS customers don’t get root access to their VPS servers. Sigmatic has somewhat budget-friendly hosting plans. Although at first glance the prices appear more expensive than the average vendor in the market, the price-to-features ratio is pretty impressive. Their VPS hosting plans are particularly attractive because they come with SSD storage and notably high bandwidth. The vendor’s backup solutions are not included in their hosting packages; users have to incur additional costs to get the backup service. The same applies to users who would want dedicated phone support and a shorter response time from the support team. The pricing of their hosting plans is listed in euros and clients can choose a monthly or yearly payment plan. Sigmatic does not have a refund policy or an uptime guarantee. To contact Sigmatic customer service, you can use their phone line available on weekdays between 9:00 a.m. and 4:00 p.m. EEST. You can also contact them via email or ticketing system, both of which are available round the clock.While they have not made a live chat available on their website, their customer support team is available 24/7. They are polite and act fast to solve the issues their customers raise. Sigmatic’s knowledge base is fairly detailed and includes a news section where they publish updates and announcements regarding the hosting, including information on scheduled maintenance. Sigmatic hosting solutions are designed to meet the needs of small and medium-sized businesses in Finland. The vendor’s affordable hosting plans coupled with a highly responsive support team have endeared them to many webmasters in Finland and beyond. Wondering how Sigmatic stacks up against other Web Hosting companies? Enter any other Web Hosting company and we will give you a side-by-side comparison.